FOUNTAIN HILLS – This is second time that 12-year-old Zane Kelly Balzarini is attending the Steven Hunter Life Skills and Basketball Academy, hosted by former Phoenix Suns center Steven Hunter. Kelly Balzarini said he has learned a lot at the camp that will help him try out for his local basketball team in Mesa. “It just helps me build self-confidence,” Kelly Balzarini said. For the second year in a row, Hunter is hosting the camp at Fountain Hills Middle School for kids like Kelly-Balzarini, but basketball is only a part of the equation. 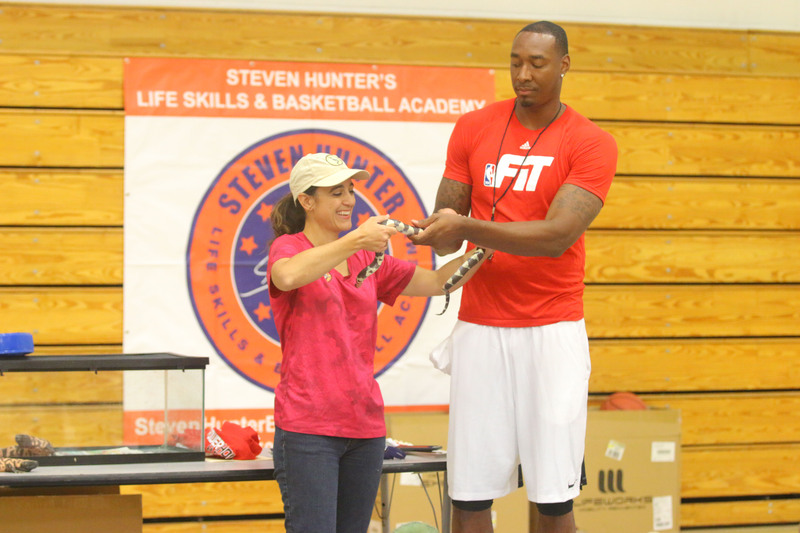 The camp, which is managed by Hunter and his wife, Erika, as part of their Steven Hunter Youth Foundation, also teaches life skills. Some of the children attending this year’s camp are on scholarships funded by local businesses that Hunter and the foundation’s director of fundraising Donna Beers solicited. When she took Hunter to ask local businesses to donate to the camp, Beers said they emphasized that it went beyond basketball. The first session of this year’s two-week basketball camp hosted nearly 100 kids, ranging from ages 8 to 14. Following nine years in the NBA and one season in Italy, Hunter said that he decided to move to Phoenix because he enjoyed his time living in the Valley during the 2004-05 NBA season. He was a part of a Suns team that year that earned the No. 1 seed in the Western Conference playoffs and tied a franchise record with 62 wins. He was named a community ambassador for the team nearly two years ago.